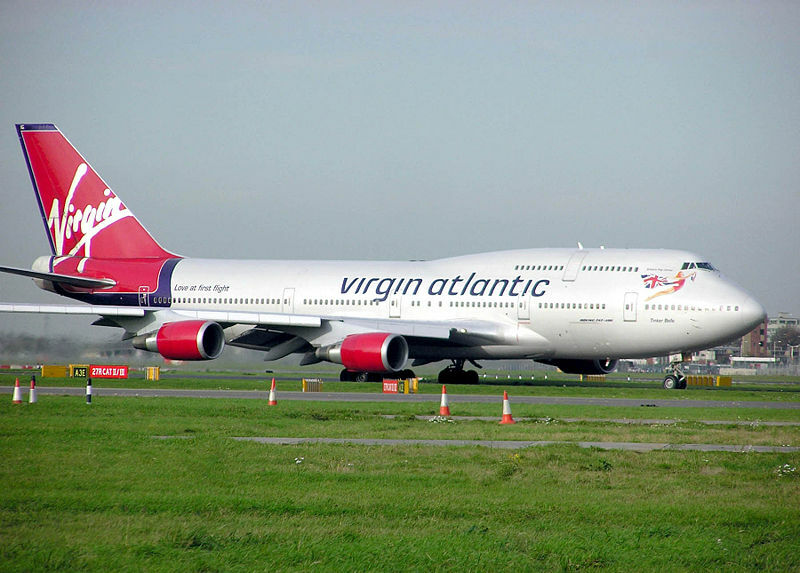 The Boeing 747 is a widebody commercial airliner, often referred to by the nickname "Jumbo Jet". It is among the world's most recognizable aircraft,and was the first widebody ever produced. Manufactured by Boeing's Commercial Airplane unit in the US, the original version of the 747 was two and a half times the size of the Boeing 707, one of the common large commercial aircraft of the 1960s. First flown commercially in 1970, the 747 held the passenger capacity record for 37 years. The 747-400, the latest version in service, is among the fastest airliners in service with a high-subsonic cruise speed of Mach 0.85 (567 mph or 913 km/h). It has an intercontinental range of 7,260 nautical miles (8,350 mi or 13,450 km). The 747-400 passenger version can accommodate 416 passengers in a typical three-class layout or 524 passengers in a typical two-class layout. The next version of the aircraft, the 747-8, is in development, and scheduled to enter service in 2010. The 747 is to be replaced by the Boeing Y3 (part of the Boeing Yellowstone Project) in the future. - 3 place crew lounge. LD3 Containers in belly: . - max. zero-fuel weight: 238.780 Kg. - max. payload: 65.770 Kg. Max. take off weight: 333.300 Kg. The 747-200B is an improved version of the 747-200, with increased fuel capacity and more powerful engines; it first entered service in February 1971. The -200B aircraft has a full load range of about 6,857 nmi (12,700 km). The 747-200F is the freighter version of the -200 model. It could be fitted with or without a side cargo door. It has a capacity of 105 tons (95.3 tonnes) and an MTOW of up to 833,000 lb (378,000 kg). It entered first service in 1972 with Lufthansa. - four Pratt & Whitney JT9D-7AW each rated 205.3 kN. - four Pratt & Whitney JT9D-7J each rated 222.4 kN. - four Pratt & Whitney JT9D-7R4G2 each rated 243.5 kN. - four General Electric CF6-50E2 each rated 230.4 kN. - four Rolls Royce RB211-524D4 each rated 231.3 kN. - max. payload: 68.180 Kg. Max. take off weight: 377.800 Kg. Max. landing weight: 285.700 Kg. - take-off run 3.170 m at max. take-off weight. - landing run 2.121 m at max. landing weight. The 747-200C Convertible is a version that can be converted between a passenger and a freighter or used in mixed configurations. The seats are removable, and the model has a nose cargo door. The -200C could be fitted with an optional side cargo door on the main deck. - four Pratt & Whitney JT9D-7FW each rated 213.5 kN. - four Pratt & Whitney JT9D-7Q each rated 235.75 kN. - four General Electric CF6-50E2 each rated 243.5 kN. - max. zero-fuel weight: 267.570 Kg. - max. payload: 130.340 Kg. - 20 economy class seats. - max. payload: 112.390 Kg. The 747-200M is a combination version that has a side cargo door on the main deck and can carry freight in the rear section of the main deck. 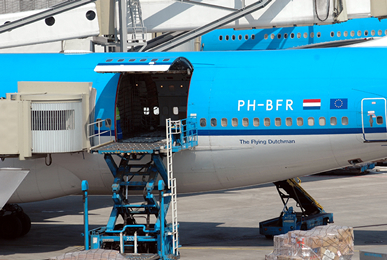 A removable partition on the main deck separates the cargo area at the rear from the passengers at the front. This model can carry up to 238 passengers in a 3-class configuration if cargo is carried on the main deck. The model is also known as the 747-200 Combi. As on the -100, a stretched upper deck (SUD) modification was later offered. A total of 10 converted 747-200s were operated by KLM. UTA French Airlines also had two of these aircraft converted. The 747-300 entered commercial service in 1983, and was the first to integrate the most significant changes of the 747 Classics. These changes included an extended upper deck and improved engines with a reduced fuel burn of 25 percent per passenger. In addition, passenger capacity increased 10 percent by extending the upper deck and relocating the new straight stairway to the rear of the upper deck (prior models had a spiral-shaped staircase in the center of the upper deck). Boeing delivered 81 747-300s in passenger, combi and short-range configurations, the last in 1990. The most visible difference between the -300 and previous models was a stretched upper deck with two new emergency exit doors and an optional flight-crew rest area immediately aft of the flight deck as standard. (The stretched upper deck had previously been offered as a retrofit and first appeared on two Japanese 747-100 SR models.) Compared to the -200, the upper deck is 23 feet 4 inches (7.11 m) longer than the -200. A new straight stairway to the upper deck instead of a spiral staircase is another difference between the -300 and earlier variants. The staircase creates room below and above for more seats. With minor aerodynamic changes, Boeing increased the cruise speed of the -300 to Mach 0.85 from Mach 0.84 on the -100/-200. The -300 features the same takeoff weight. Two of the three engine choices from the -200 were unchanged in the -300, but the General Electric CF6-80C2B1 was offered instead of the CF6-50E2 offered on the -200. The 747-300 name, which was proposed for a variant that was never launched, was revived for this new version, which was introduced in 1980. Swissair ordered the first 747-300 on 11 June 1980. 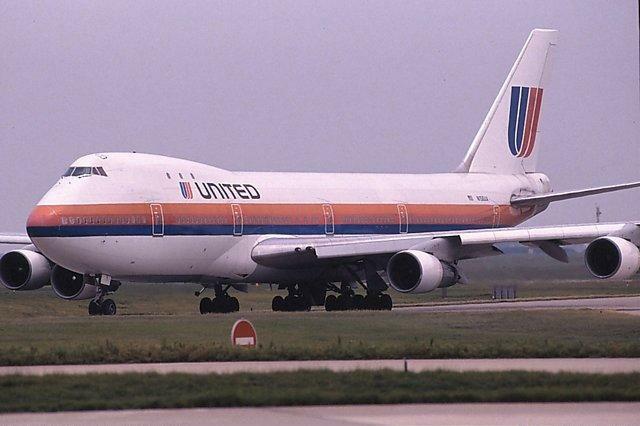 The 747-300 first flew on 5 October 1982. Swissair was the first customer to accept delivery on 23 March 1983. In addition to the passenger version, other versions were available. The 747-300M has cargo capacity in the rear portion of the main deck similar to the -200M, but with the stretched upper deck it can carry more passengers. 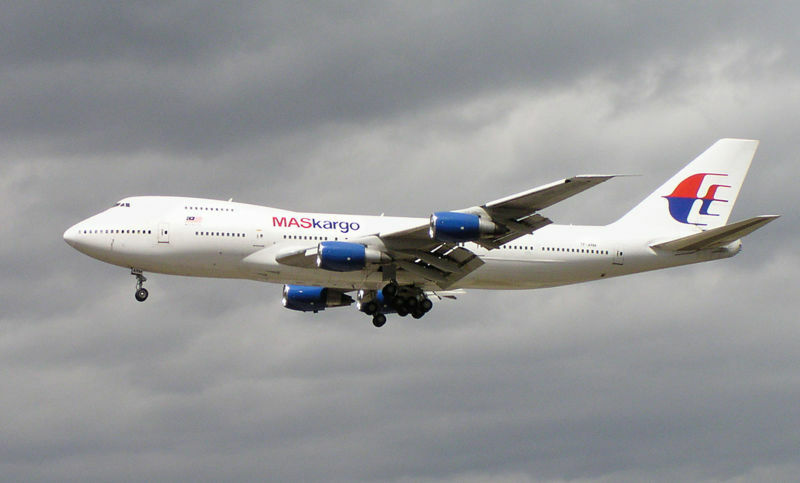 The 747-300SR is a short range version to meet the need for a high-capacity domestic model. Japan Airlines operated such aircraft with more than 600 seats on the Okinawa–Tokyo route and elsewhere. 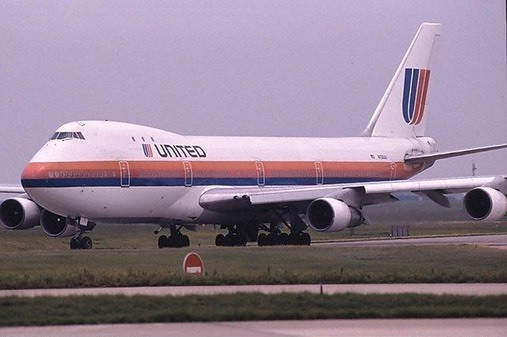 Boeing never launched a newly built freighter version of the 747-300, but it modified used passenger -300 models into freighters starting in 2000. A total of 81 aircraft were delivered, 56 for passenger use, 21 -300M and 4 -300SR versions. The 747-300 was soon superseded by the launch of the more advanced 747-400 in 1985, just two years after the -300 entered service. The last 747-300 was delivered in September 1990 to Sabena. 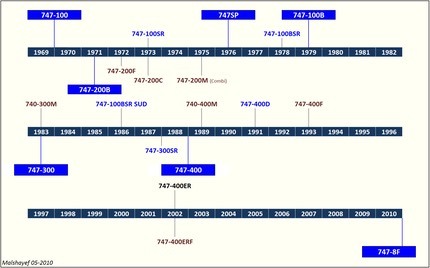 Today, many -300 aircraft are still active, despite a significant loss of interest in the series among large carriers who replaced the 747-300 with the 747-400. Air France and Qantas were some of the last major carriers to operate the 747-300. On 29 December 2008, Qantas flew its last scheduled 747-300 service, operating from Melbourne to Los Angeles via Auckland. On 20 January 2009, Qantas' last 747-300 was flown to the United States for storage. Carriers still using the -300 include Japan Airlines and Saudi Arabian Airlines. 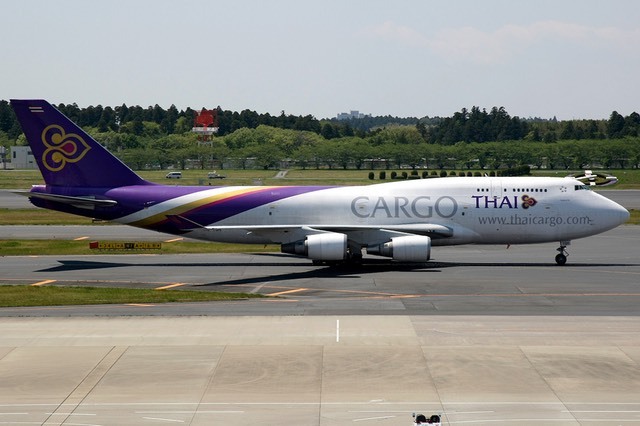 Although none were constructed as dedicated freighters, a few -300s have been converted to cargo operations. The 747-300M has cargo capacity in the rear portion of the main deck similar to the -200M, but with the stretched upper deck it can carry more passengers. The 747-400 was announced by Boeing Commercial Airplanes in October 1985. Compared to the 747-300 the 747-400 has 6 feet (1.8 m) wing tip extensions and 6 feet (1.8 m) winglets, and a glass cockpit which dispensed with the need for a flight engineer. The 747-400 also improved on the -300 with tail fuel tanks, revised engines, an all-new interior, revised fuselage/wing fairings and newer in-flight entertainment. Like the 747-300, the passenger version of the 747-400 included the stretched upper deck (SUD) as a standard feature. The SUD was almost twice as long as the standard upper deck. It had previously been offered as a retrofit and first appeared on two Japanese 747-100 SR models. While the wingspan was increased, the overall weight of the wings was decreased due to the use of composites and aluminum alloys. It was rolled out in January 1988 and first flew on 29 April 1988. Certification was received on 10 January 1989 with Pratt & Whitney PW4000 engines, 18 May 1989 with CF6-80C2s and 8 June 1989 with Rolls-Royce RB211-524Gs. The first 747-400 was delivered to Northwest Airlines on 26 January 1989, with service entry on 9 February. The 747-400 is an improved version of the 747-300 with increased wingspan, winglets, revised engines and a glass cockpit that removed the need for a flight engineer. The 747-400 passenger version features a stretched upper deck (SUD) like the 747-300 as a standard feature. In 1989, a Qantas 747-400 flew non-stop from London to Sydney, a distance of 9,720 nmi (11,190 mi, 18,000 km) in 20 hours and 9 minutes, although this was a delivery flight with no commercial passengers or freight aboard and using extra dense jet aviation fuel produced specially by Shell. Production of the 747-400 passenger version officially ceased on 15 March 2007.The last four -400s on order were canceled by Philippine Airlines (which switched to the 777-300ER). 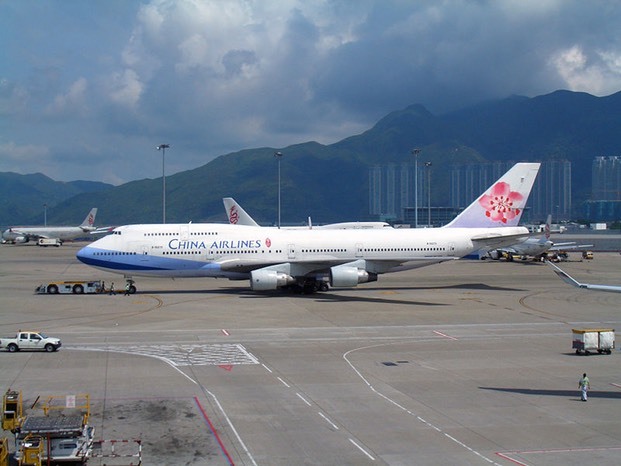 The last to order the -400 was China Airlines in November 2002, with the last passenger 747-400 constructed in 2005 and delivered in April of that year. It was the 1358th 747 (MSN33737/B-18215). 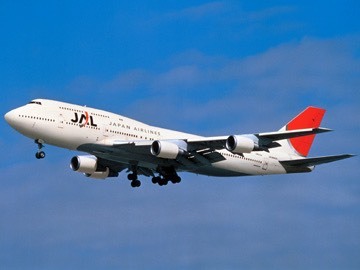 The 747-400 Domestic first flew on 18 March 1991 and entered service with Japan Airlines on 22 October 1991. The last was delivered to All Nippon Airways in December 1995. 19 747-400D were built primarily for the Japanese market. The 747-400ER (Extended range) was launched on 28 November 2000 following an order by Qantas for 6 aircraft. This was ultimately the only order for the passenger version. The -400ER can fly an additional 805 km or carry 6,800 kg more freight. Qantas received the first -400ER on 31 October 2002. The 747-400ER includes the option of 1 or 2 additional 3,240 US gallon body fuel tanks in the forward cargo hold. Manufactured by Marshall Aerospace, these tanks utilize innovative metal to metal honeycomb bonded technology to achieve an incredibly high dry weight to fuel volume ratio. Similar technology has been used in the development by Marshall of body fuel tanks for the 777-200LR and P-8A Poseidon MMA aircraft. 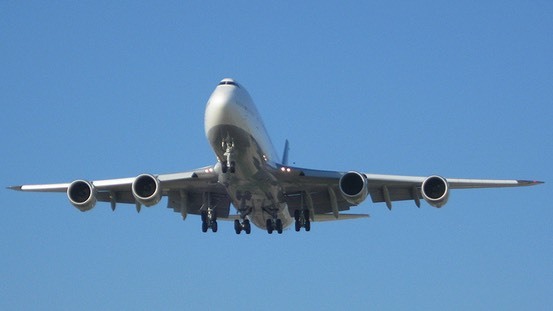 The 747-400ERF is the freight version of the -400ER, launched on 30 April 2001. The -400ERF was delivered to Air France (via ILFC) on 17 October 2002. The 747-400ERF has a maximum payload of 248,600 pounds (112,760 kg)(maximum takeoff weight is 910,000 pounds) and offers the cargo airline the choice of either adding 22,000 pounds (9,980 kg) more payload than other 747-400 freighters, or adding 525 nautical miles (972 km) to the maximum range. It has a maximum range of 9,200 km, about 525 km farther than other 747-400 freighters, and has a strengthened fuselage, landing gear and parts of its wing, along with new, larger tires. Boeing has seven 747-400ERF aircraft yet to be delivered in June 2008. The new 747-8 Freighter will have more payload capacity but less range than the 747-400ERF. The 747-400BCF (Boeing Converted Freighter), formerly known as the 747-400SF (Special Freighter), is a conversion program for standard passenger 747-400s. The project was launched in 2004. The first Boeing 747-400BCF was redelivered to Cathay Pacific Cargo and entered service on 19 December 2005. Announced at the Asian Aerospace 2002 show in Singapore and supposed to enter service in 2004. The development of the plane was abandoned and effort was put into the 747-8. Following the termination of the 747X program, Boeing continued to study improvements which could be made to the aircraft. The 747-400XQLR (Quiet Long Range) would have featured longer range than the 747-400ER, at 7980 nm (14,800 km), along with improvements to improve efficiency and reduce noise. 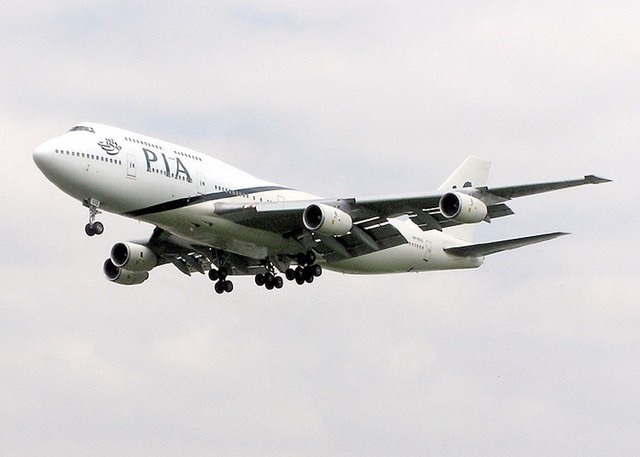 The "X" in the title signified it as a variation of the 747-400. In order to make the new 747 more environmentally friendly, the engines were given new acoustic liners and were equipped with "chevron" shaped cowlings around the fan and core exhausts. The result was a 20% reduction in what is know as "noise area level" on takeoff and a decrease of 40% on landing as compared to the standard 400. Other improvements included extra fuel storage in the horizontal tail tank and a gross weight increase from 910,000 pounds to 921,000. The QLR also spotted raked wingtips similar to those on the extended range 777 and the 767-400ER. 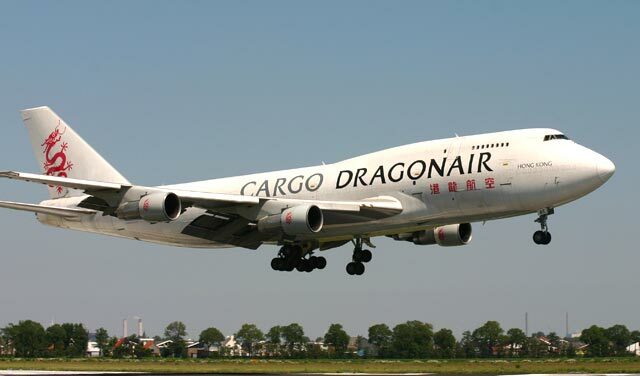 The 747 has proven to be a very popular freighter, carrying around half of the world's air freight as of 2007. In an effort to maintain this dominant position, Boeing has developed a freight variant of the 747-8, dubbed 747-8 Freighter or 747-8F. The 747-8F will be the initial model to see entry into service (EIS). 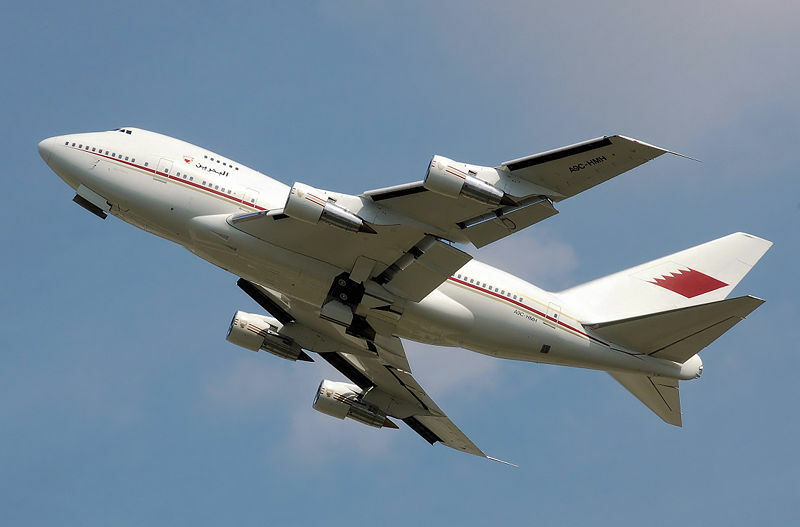 As on the 747-400F, the upper deck is shorter than passenger models; the 18 feet 3½ inches (5.58 m) stretch is just before and just aft of the wing. With a 970,000 lb (440,000 kg) maximum take-off weight, it will have a total payload capability of 308,000 lb (140,000 kg) and a range of 4,475 nmi (8,288 km).Four extra pallet spaces will be created on the main deck, with two extra containers and two extra pallets on the lower deck. The 747-8F achieves a 16% lower ton-mile operating cost than the 747-400F and offer a slightly greater range. The 747-8F has more payload capacity but less range than the current 747-400ERF. When Boeing launched the ERF, all of the 35,000 lb (16,000 kg) increase in MTOW over the 747-400F 875,000–910,000 lb (397,000–413,000 kg)) allowed airlines to take off with more fuel, burn it during flight, and land at the same weight as the regular 747-400F. 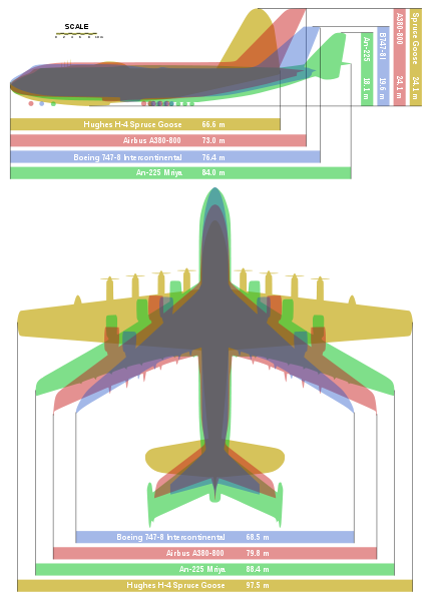 This increased the range of the 747-400ERF compared to the 747-400F. Cargo carriers such as Cargolux often move machinery or indivisible loads that require a plane with a higher payload and landing capability. As is common with cargo planes, range is given with maximum payload, not fuel. The 747-8's 60,000 lb (27,000 kg) MTOW increase (970,000 lb or 440,000 kg) has been directed exclusively to its Zero-Fuel weight or payload capacity. 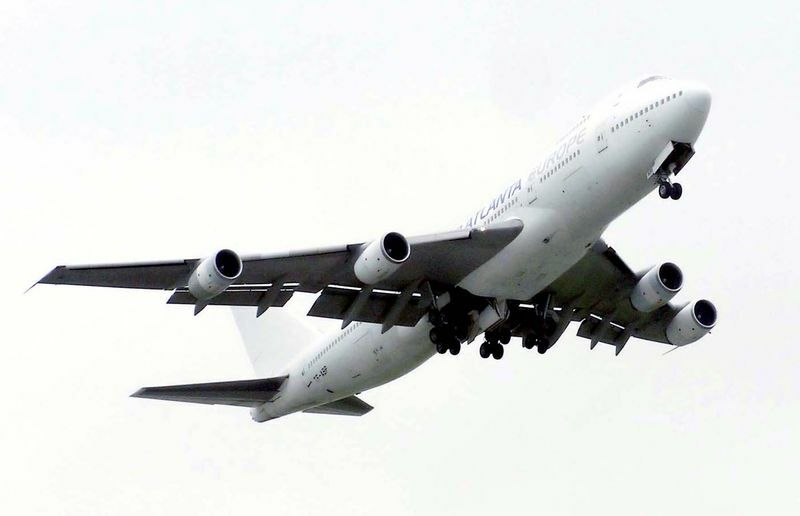 If taking off at maximum payload, the 747-8 takes off with its tanks roughly half empty. On trips where the payload is not at maximum, the plane can take on more fuel and extend its range. 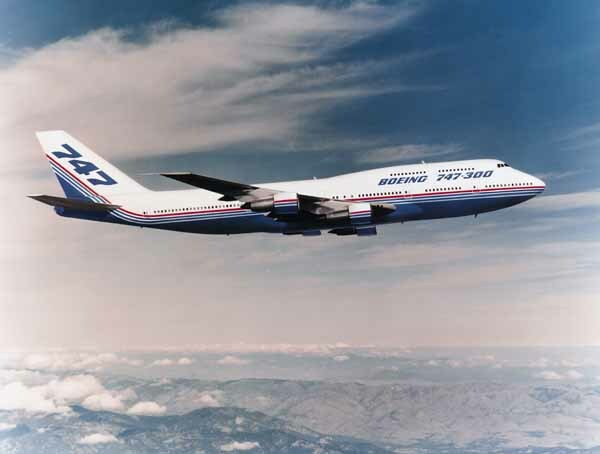 Boeing announced the 747-500X and -600X at the 1996 Farnborough Airshow. The proposed models would have combined the 747's fuselage with a new 251 ft (77 m) span wing derived from the 777. Other changes included adding more powerful engines and increasing the number of tires from two to four on the nose landing gear and from 16 to 20 on the main landing gear. The 747-500X concept featured an 18 ft (5.5 m) stretch to 250 ft (76.2 m) long, and the aircraft was to carry 462 passengers over a range up to 8,700 nautical miles (10,000 mi, 16,100 km), with a gross weight of over 1.0 Mib (450 Mg). The 747-600X concept featured a greater stretch to 279 ft (85 m) with seating for 548 passengers, a range of up to 7,700 nmi (8,900 mi, 14,300 km), and a gross weight of 1.2 Mlb (540 Mg). A third study concept, the 747-700X, would have combined the wing of the 747-600X with a widened fuselage, allowing it to carry 650 passengers over the same range as a 747-400. The cost of the changes from previous 747 models, in particular the new wing for the 747-500X and -600X, was estimated to be more than $5 billion. Boeing was not able to attract enough interest to launch the aircraft. During the late 1960s and early 1970s, Boeing studied the development of a shorter 747 with three-engines to compete with the smaller L-1011 TriStar and DC-10. The 747 trijet would have had more payload, range and passenger capacity. The center engine would have been fitted in the tail with an S-duct intake similar to the L-1011's. However, engineering studies showed that a total redesign of the 747 wing would be necessary. Maintaining the same 747 handling characteristics would be important to minimize pilot retraining. Boeing decided instead to pursue a shortened four-engine 747 that resulted in the 747SP. In the 1990s, the Boeing 777, a long range twinjet airliner smaller than the 747-400 entered service in the market where the 747-300 had been targeted.